Update - Latest news is that Dileep Manju Warrier divorce issue finally came to an end on Saturday (Jan.31, 2015) with the official order announced here by Ernakulam Family Court, while neither of them were appeared for the last verdict. The court granted the divorce as per their mutual petition and the custody of their lone daughter Meenakshi is will be with Dileep, however Manju would be free to visit her daughter at any time. Meanwhile on Thursday (Jan.29, 2015), both the stars have appeared before the Ernakulam Family court to furnish the formalities of their separation. In which, Court had reserved the final orders to be announced on Saturday when most favourite celebrities would be declared officially separated. Earlier both have filed Joint petition with mutual consent on July 24th 2014, at the Court. Their hearing was supposed to take place on Jan.27, 2015 as there was a gap of 6 month to consider the case for counselling. an interview that he and Manju have been living separately for past one year. Malayalam actress Manju Warrier and actor Dileep's relationship news have gained lot of attention in recent past and it is being one of the hot news around paparazzi. Latest buzz in Mollywood is that Manju Warrier and Dileep finally have all settled to take divorce. If the reports are to be believed, then both have signed the documents regarding their separation, which have been filed in the Thrissur family court. It is also reported that time taken in property division had delayed the divorce between two stars of tinsel town and now it is all finalized with the custody of their lone daughter as well. At present their daughter Meenakshi is living with Dileep. Even with recent interviews, both have ignored the questions about their personal life. video source - People TV. 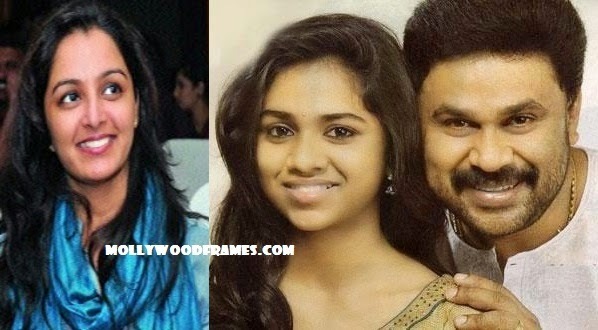 In a recent conversation actor Dileep also mentioned that "I am living for my daughter and I don't waste any chances that i get to spend with my daughter. After a certain age in their lives, maybe someone will come and they will get busy with their life and career. ", which have kind of raised the ears of gossipers. Read - Manju dropped Gopalakrishnan from her surname. Their separation grapevine have gained momentum at that time, when Manju Warrier reportedly drops Dileep's name from her surname. The reports went viral, where a newspaper advertorial claims 'change of name', which was supposed to be done for name change in actress passport. The rumours have also got much hype, when Manju Warrier came online with her website and set up her follower page on Facebook and Twitter. Manju Warrier and Dileep divorce issues and their daughter Meenakshi. In one of Manju Warrier's dance show, where she publicly announced her comeback to Malayalam cinema with a Ranjith movie. However later director himself informed the project got shelved due to script's similarity with recent released movie. The actress had saw success in her career with the movie "Sallapam", in which the co-star was her husband Dileep. Later both have together done movies like "Ee Puzhayum Kadannu" and "Kudamattam". This will put an end to their long 14 years of married life. Currently she is working for Rosshan Andrrews directorial new movie "How Old Are You". Manju Warrier launched her website. Gorgeous career of actress named Manju Warrier.